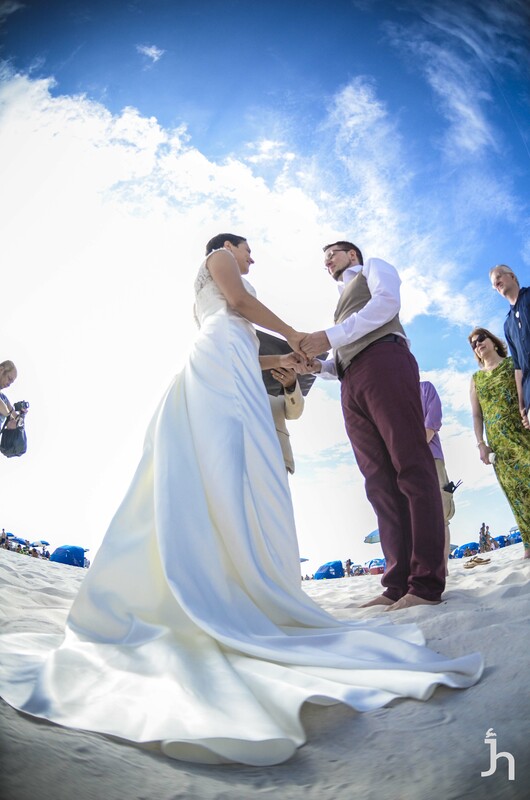 Clearwater Beach was crowded this past Sunday with the Sugar Sand Festival … but Sarah and Joshua managed to have an intimate wedding ceremony in the midst of it all! Sarah was escorted by her father across the sand to join Joshua in the middle of a semicircle of close friends and family. There, with the sugar white sand of Clearwater Beach and the sparkling blue Gulf of Mexico as their backdrop, the couple shared their vows, exchanged rings, and were pronounced husband and wife by Rev. Rick Lackore of Sensational Ceremonies, LLC . After their ceremony a crowd of beach goers that had gathered for their ceremony clapped and cheered for the happy couple. Wedding Photographer Jonathan Hare provided this amazing image of Sarah and Joshua. Congatulations to the new Mr. and Mrs. Joshua Peek!